Evidence based medicine depends on unbiased selection of completed randomized controlled trials. For completeness it is important to publish all trials. This report describes the first large randomised controlled trial where combination therapy was compared to placebo therapy and to ribavirin monotherapy, which has not been published untill now. One hundred and twenty one patients with chronic hepatitis C and elevated transaminases who did not respond to previous treatment with standard interferon monotherapy, were included from 16 centers in Belgium, the Netherlands and Luxembourg between 1992 and 1996. Patient poor-response characteristics were: genotype 1 (69%), HCV RNA above 2 × 106 copies/ml (55%) and cirrhosis (38%). Patients were randomized to 6 months combination therapy with interferon alpha-2b (3 MU tiw) and ribavirin (1000–1200 mg / day), 6 months ribavirin monotherapy (1000–1200 mg / day) or 6 months ribavirin placebo. The study was double blinded for the ribavirin / placebo component. One patient did not fit the entry criteria, and 3 did not start. All 117 patients who received at least one dose of treatment were included in the intention to treat analysis. At the end of treatment, HCV RNA was undetectable in 35% of patients on combination therapy and in none of the patients treated with ribavirin monotherapy or placebo. The sustained virological response rate at 6 months after therapy was 15% for patients treated with interferon and ribavirin. During the 6 months treatment period 13% of patients on interferon ribavirin combination therapy, 13% of patients on ribavirin monotherapy and 11% of patients on placebo withdrew due to side effects or noncompliance. At 24 weeks of treatment the mean Hb level was 85% of the baseline value, which means a mean decrease from 9.1 mmol/l to 7.8 mmol/l. The Hb levels at the end of treatment were not significantly different from patients treated with ribavirin monotherapy (p = 0.76). End of treatment WBC was significantly lower in patients treated with combination therapy, compared to ribavirin (p < 0.01) as well as for patients treated with ribavirin monotherapy compared to placebo (p < 0.01). This belated report on the only placebo controlled study of interferon ribavirin combination therapy in non responders to standard doses of interferon monotherapy documents the effectiveness, be it limited, of this approach as well as the dynamics of the effects on blood counts. Until a decade ago, interferon was the only drug available for the treatment of hepatitis C. Only a minority of patients had a sustained response to standard doses of interferon monotherapy. However, non-responders might be still amendable to therapy by either high-dose daily interferon  or by standard interferon in combination with ribavirin . This is a belated full report on the the first and probably only RCT where combination therapy was assessed in comparison to ribavirin monotherapy and to placebo therapy. Patients between 18 and 70 years of age with chronic hepatitis C, no ALT normalisation during and after treatment and positive HCV RNA after treatment with interferon monotherapy, were elegible for the study. The previous treatment course consisted of three mega units interferon thrice weekly for 24 weeks or at least eight weeks of treatment with 6 mega units interferon thrice weekly or at least 4 weeks of 10 mega units interferon thrice weekly. Patients with hepatitis of other viral origin, patients with inherited metabolic liver disease, patients with acquired metabolic liver disease related to alcohol, hepatotoxic drugs or obesity and patients with autoimmune hepatitis were excluded from the study. Other exclusion criteria were significant medical illness within the past five years, pregnancy or likelihood of becoming pregnant, immune modulating therapy (corticosteroids) within the past 6 months, inadequate levels of hemoglobin (< 6 mmol/l), platelet count (<50 × 10e9/l), white blood cells (< 3 × 10e9/l), signs of hepatocellular carcinoma or decompensated liver disease, recent drug or alcohol addiction and unlikeliness to attend regularly for treatment and follow up. Data were collected in 16 centers in Belgium and in the Netherlands; central data collection was done in the Erasmus Medical Center in Rotterdam, the Netherlands. The study received ethics committee approval in all centers involved and all patients gave signed informed consent. 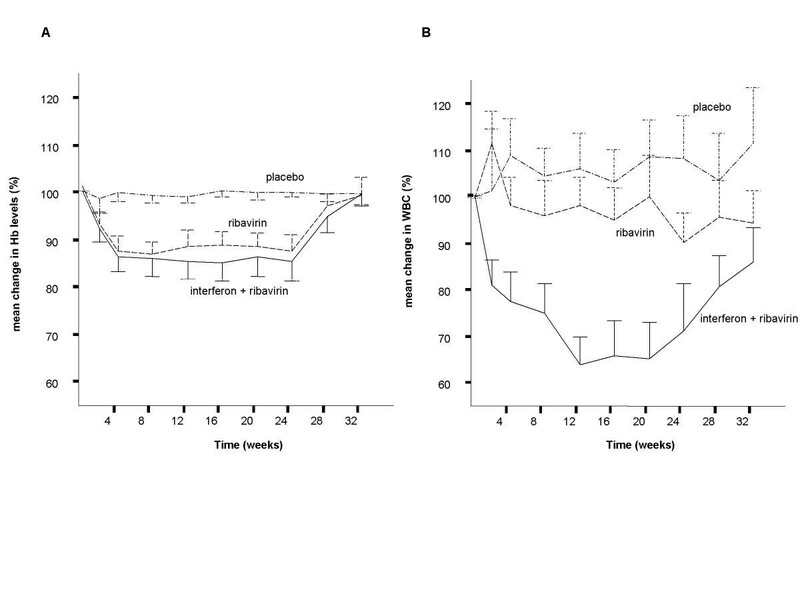 Patients were randomised and assigned to receive either ribavirin (ICN pharmaceuticals, Bucks, United Kingdom) monotherapy or a matched placebo orally twice a day in a total dose of 1200 mg a day (body weight ≥ 75 kg) or 1000 mg a day (body weight <75 kg) for 24 weeks, or interferon (Intron A, Schering Plough, Kenilworth, NJ, USA) 3 mega units thrice a week combined with ribavirin 1000 or 1200 mg according to body weight during 24 weeks. All patients were assessed in an outpatient setting for safety, tolerance and efficacy at the end of weeks 2, 4, 8, 12, 16, 20 and 24 and every 4 weeks during follow up until week 48. Initial HCV-RNA was measured by bDNA with a lower detection limit of 2000 copies/ml, HCV-RNA negativity at week 24 and week 48 was measured by PCR. HCV-RNA and hematologic- and biochemical parameters were measured in the certified laboratories of the participating hospitals; results were corrected for local normal values. Liver biopsies, taken within 12 months before treatment were reviewed by the local pathologist for the presence or absence of cirrhosis. 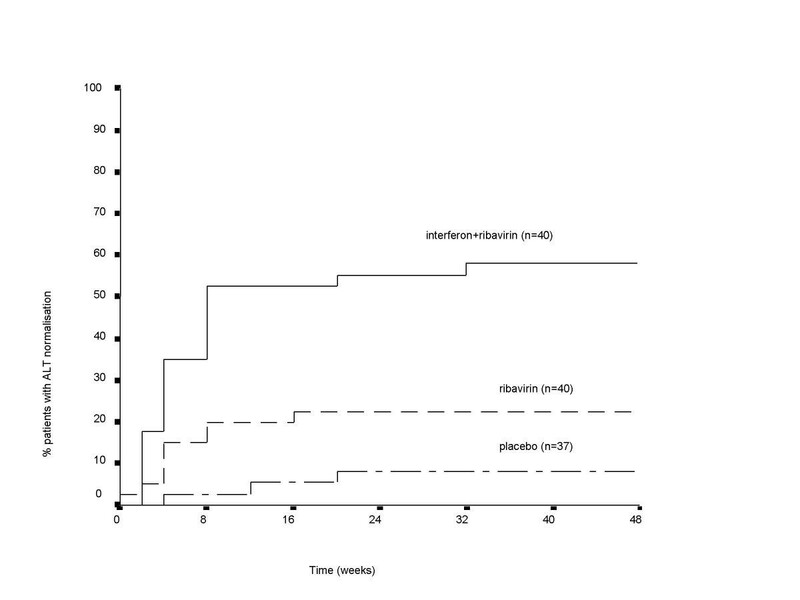 The objective of this study was to evaluate if interferon ribavirin combination therapy or ribavirin monotherapy would be a therapeutic option for non-responders to previous interferon therapy. The primary endpoint for this study was defined as loss of detectable serum HCV RNA 24 weeks after the end of treatment. The secondary endpoint was normalisation of alanine aminotransferase 24 weeks after treatment. 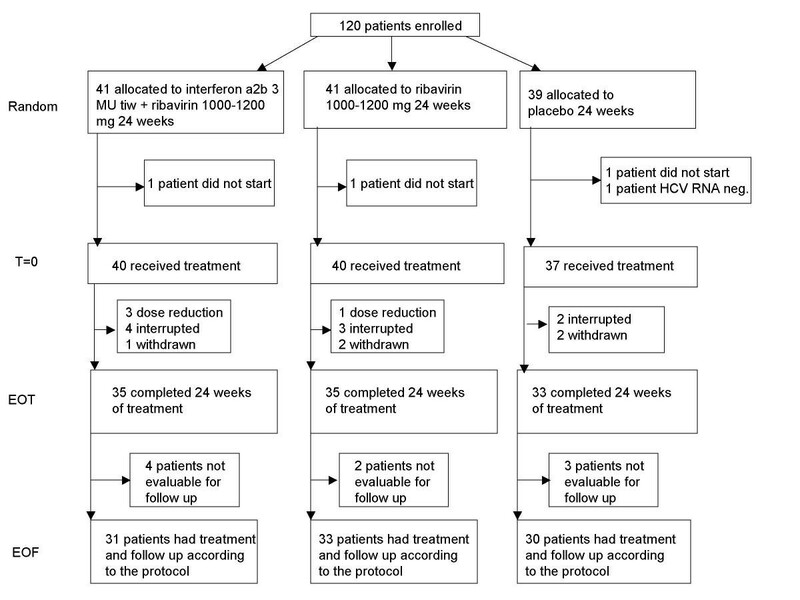 It was calculated that 120 patients (40 per treatment arm) were needed in order to have 90% chance of detecting a difference of 30% at the significance level of p = 0.05 (single sided testing) in disappearance of HCV RNA or normalization of ALT levels, assuming the frequency of these endpoints would be ten percent or less in the placebo group. Criteria for 50% dose reduction of ribavirin were anemia with Hb < 5.4 mmol/l or excessive subjective symptoms such as myalgia, fatigue or dyspepsia interfering severely with daily activities. Criteria for a 50% dose reduction of the total weekly interferon dose included leucopenia < 1.5 ×10e9/l, thrombocytopenia < 40 ×10e9/l or excessive subjective symptoms interfering with daily activities. Randomization was performed centrally at the coordination center in Rotterdam, the Netherlands after receiving all entry data, by opening an envelope . Patients were randomized to either combination therapy or monotherapy at a ratio of 1:2 after stratification for the presence of cirrhosis. The ribavirin and placebo arms were double blinded. Patients allocated to monotherapy received blinded study medication containing either ribavirin or placebo. The randomization code of the monotherapy arms of the study remained concealed until all patients had completed their follow up and the database had been verified and closed. All statistical analyses were peformed using SPSS for Windows (Version 10 SPSS Inc, Chicago, IL, USA). The Kaplan Meier method was used to evaluate the time of ALT normalisation according to treatment using the log rank test to assess statistical significance. The Pearson Chi-square test was used to compare the differences in mean end of treatment and end of follow up response between the different groups. The Mann Whitney test was used to compare the differences in mean end of treatment blood counts. 121 patients were recruited from 16 university and affiliated hospitals in Belgium, the Netherlands and Luxembourg ('Benelux'). 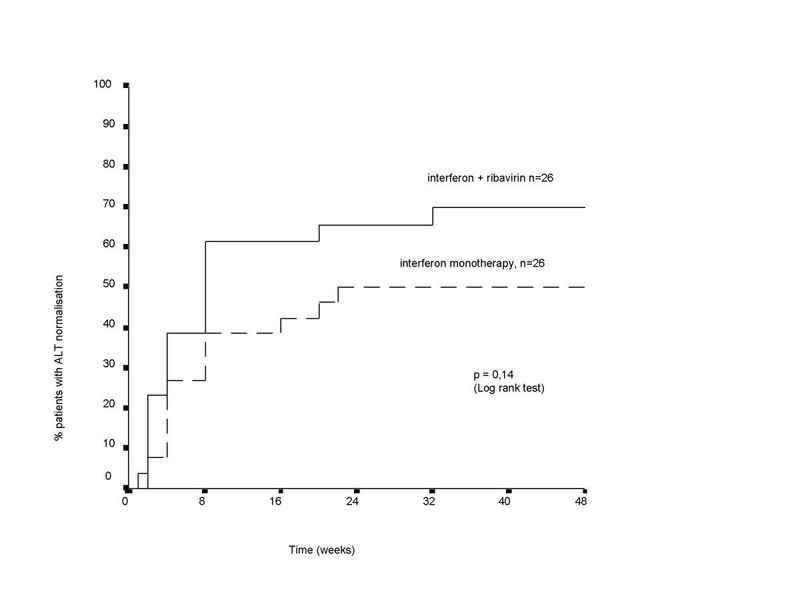 Seventy seven patients had been treated in a previous Benelux study on interferon mono therapy , the other 44 had been treated with a comparable treatment schedule of 6 MU interferon thrice a week for at least 12 weeks or 3 MU for at least 24 weeks. One patient was excluded in view of a negative HCV RNA-test at baseline and three never started therapy. All remaining 117 patients were included in the analysis (fig 1). Trial profile. Patients who had a dose reduction following the protocol were included in all analyses. Patients were recruited between 1992 and 1996. There were no differences in patient characteristics between the 3 treatment groups (table 1). Patient poor-response characteristics were: genotype 1 (69%), HCV RNA above 2 × 106 copies/ml (55%) and cirrhosis (38%). The results are presented on the basis of patients who received at least one dosis of study medication, the intention to treat population. 40 patients received at least one dose of combination therapy, another 40 patients received at least one dose of ribavirin and 37 patients received at least one dose of placebo. Patients who received combination therapy had significantly better responses than patients treated with ribavirin monotherapy or placebo, both virologically (HCV-RNA negativity) as well as biochemically (ALT normalisation). At the end of treatment, HCV RNA was undetectable in 35% of patients on combination therapy and in none of the patients treated with ribavirin monotherapy or placebo. The sustained virological response rate at 6 months after therapy was 15% for patients treated with interferon and ribavirin (table 2). 18% of patients receiving combination therapy, 3% of patients receiving ribavirin monotherapy and 3% of patients receiving placebo treatment had persistently normal ALT levels during 24 weeks follow up (table 3). Hemoglobin levels decreased in patients treated with combination therapy and in patients treated with ribavirin monotherapy (fig 3A). After week four a plateau-phase was reached. There was a significant difference between the end of treatment Hb change of the patients receiving combination therapy or ribavirin monotherapy, compared to patients treated with placebo (p < 0.01). The difference in mean end of treatment Hb change between combination therapy and ribavirin monotherapy was not statistically significant (p = 0.76). Changes in blood counts over time, by treatment. A: hemoglobin; B: total white blood cells. Hemoglobin levels returned to baseline values for both groups within 8 weeks after cessation of treatment. Placebo treatment did not significantly affect hemoglobin levels. White blood counts decreased in patients treated with combination therapy with interferon and ribavirin (fig 3B). At week 12 the mean WBC for this group was 64% from the baseline value. After week 12 a plateau-phase was reached. Ribavirin monotherapy also caused a small, but significant decrease in mean WBC. Placebo treatment did not affect WBC levels. The mean change in WBC at the end of treatment was greater for the patients treated with combination therapy than for patients treated with ribavirin monotherapy (p < 0.01). There was also a significant difference between the end of treatment WBC change in patients receiving ribavirin monotherapy compared to patients treated with placebo (p < 0.01). Base-line characteristics of the patients (intention-to-treat population). *means ± SD. †Assessed by bDNA in 68 patients (24 interferon+ribavirin, 22 ribavirin, 22 placebo). HCV RNA response at end of therapy and end of follow up, by therapy. 1normal ALT on at least two occasions with at least 1 month interval, p < 0.01 (Pearson Chi-square). 2normal ALT at week 24 and at least one month earlier, p < 0.01 (Pearson Chi-square). 3persistently normal ALT levels during 24 weeks follow up, p = 0.02 (Pearson Chi-square). During the 6 months treatment period 13% of patients on interferon ribavirin combination therapy, 13% of patients on ribavrin monotherapy and 11% of patients on placebo withdrew due to side effects or noncompliance (figure 1). In the group receiving combination treatment 3 patients needed dose reduction of interferon because of dyspnoea, depression and pyelonephritis One patient stopped interferon and had a dose reduction of ribavirin because of subjective side effects and anemia. Among patients treated with ribavirin, one had a dose reduction because of anemia which gave rise to cardiovascular complaints. One interrupted therapy because of vasculitis. Figure 4 shows the rates of ALT normalisation of 26 patients who were treated in a previous trial with interferon monotherapy  compared to the rates of ALT normalisation the same patients showed in this trial on combination therapy. There is a trend towards increased ALT normalisation rate with interferon and ribavirin combination therapy. Cumulative probability of ALT response during treatment. Patients treated with combination therapy in this trial vs results of the same patients in a previous trial with interferon monotherapy . There is a trend towards increased normalisation rate with interferon and ribavirin combination therapy. In 1991 there were two main therapeutic options for patients not responding to standard doses of interferon monotherapy: treatment with high daily doses of interferon  or combination therapy with interferon and ribavirin. To test this second option we started this randomised controlled trial, in which we compared combination therapy with interferon and ribavirin to ribavirin monotherapy and to placebo. This trial is scientifically sound, with high enough numbers treated to draw reliable conclusions. The feasibility of such a trial was, however, low because of the placebo arm included; consequently it took several years for inclusion of all patients. Part of the results of this study were published in meta-analyses . This full report can still be of value for meta-analysis by the Cochrane approach and can serve as a reference for ribavirin monotherapy in non-responders and for placebo therapy in non-responders. This study documents a significant, though small effect of adding ribavirin to the treatment of non-responders. Since then various RCT have been published comparing combination therapy with interferon monotherapy [6–9]. Saracco et al. reported sustained response rates comparable to the 15% we found in this study in patients asssigned to a comparable treatment schedule . In meta-analyses that have been published on this subject, also response rates of 14–16% have been reported [10–13]. One way to increase response rates in patients retreated with combination therapy, is to make a stricter selection and to treat only subgroups of patients who are more likely to have a sustained response. Camma et al state that sustained response rates can be increased to 30% by selecting patients less than 45 years old with normal gammaglutamyltransferase levels and by treating them with high dose long course combination therapy . Indeed Saracco et al have shown that non-responders benefit the most from prolonged treatment with high dose interferon, achieving response rates up to 23 % in these patients. In naive patients good results are obtained by treatment with pegylated interferon combined with ribavirin [14, 15]. New studies are on their way evaluating the effect of pegylated interferon and ribavirin in non-responders to interferon. This trial where combination treatment is compared to ribavirin monotherapy and placebo therapy, gives us the opportunity to determine which adverse effects can be expected from which medication. The decrease in WBC in combination therapy is mainly due to interferon, but also ribavirin causes a modest, though significant decrease in WBC. The decrease in Hb levels seen during combination therapy is almost entirely caused by ribavirin, with only a marginal additional effect of interferon. Participants in this study of the Benelux Study Group on treatment of chronic hepatitis C are: 1M. Adler, 2G.P van Berge Henegouwe, 1N. Bourgeois, 3J.T. Brouwer, 4P. Buydens, 5R.A.F.M. Chamuleau, 6J. Delwaide,7Th.J.M. Ditzhuysen, 8A. Elewaut, 9J. Fevery, 10H. Fierens, 11C. de Galocsy,3B. Hansen, 2J. van Hattum, 8M.L. Hautekeete†, 12B. van Hoek, 10P. Michielsen, 13C.J. Mulder, 9F. Nevens, 14J.W. den Ouden-Muller, 5H.W. Reesink, 3S.W. Schalm, 15H. Tuynman8J. Versieck, 8H. van Vlierberghe, 13R.A. de Vries, 5C.J. Weegink, 16P.J. Wismans. 1Erasme University Hospital, Brussels, Belgium; 2University Hospital Utrecht, the Netherlands; 3Erasmus Medical Center, Rotterdam, the Netherlands; 4University Hospital Brussels, Belgium; 5Academic Medical Center Amsterdam, the Netherlands;6University Hospital Liege, Belgium; 7Hospital Willem Alexander, 's-Hertogenbosch, the Netherlands; 8University Hospital Gent, Belgium; 9University Hospital Louvain, Belgium; 10University Hospital Antwerpen, Belgium; 11Clinic St Anne, Brussels, Belgium; 12Leiden University Medical Center, Leiden, the Netherlands,13Rijnstaten Hospital, Arnhem, the Netherlands; 14St Franciscus Hospital, Rotterdam, the Netherlands; 15Medical Center Alkmaar, Alkmaar, the Netherlands, 16Haven Hospital, Rotterdam, the Netherlands. Investigator initiated study, coordinated by the Foundation for Liver Research in Rotterdam, the Netherlands. ICN Pharmaceuticals and Schering Plough International provided free drug, placebo and financial support.